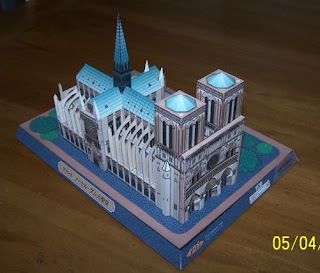 A few years back, Canon Paper-Craft- http://cp.c-ij.com/en/ -produced a paper model of the Cathedrale Notre-Dame. 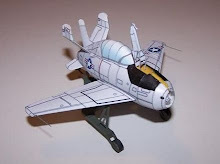 The model is very well designed and is a free download to booth. This model is now rests in a curio cabinet of a neighbor. 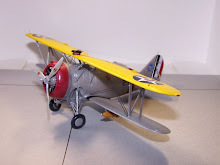 I thought I would share a few pictures of the model with readers. 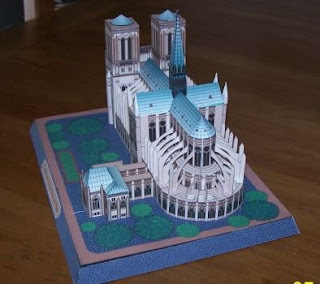 Building the Notre-Dame is straight forward in terms of following the instructions provide with the model. I printed the model on standard card stock available almost everywhere. It was printed on an Epson printer. Epson printers offer waterproof ink and does not lend itself to marks as easy as most ink jet inks do. The only change I made to the model was to double the braces that surround the nave area. Minox "THE SPY CAMERA" Extraordinaire! Of the many cameras I have owned over the years of my life, the Minox has been one of my favorites. These cameras carry the distinct label of "Spy Camera". Minox cameras were never designed as such and except for one or two rare occasions never used by any Secret Agency. The term "Spy Camera" is due in most parts to Hollywood movies, It has been used in several movies most recently in the Movie "Shinning Through" with Michael Douglas and Melanie Griffith. Other such movies like James Bond and a few World War 2 era films are mostly responsible for attaching the term "Spy Camera" to the Minox. Without going into a great amount of detail about how the Minox works and all the technical details, let me say it is suffice to say the Minox uses a strip of photographic film inside a cartridge and yields several negative images measuring 8 mm x 11 mm per image. Today one can still purchase several different models of these cameras on Ebay although finding film and processing is getting harder to obtain. I always carry my Minox with me daily even yet today. While thinning out a vast amount of photo CD's in my collection, I came across some Minox pictures that were transfered to CD by the processing lab a few years back. I came across three pictures that I thought I would share with you. The tractor, I understand dates back to the 1920's and the photos were taken in the late afternoon with my Minox model ECX. When one considers the size of the original negative 8 mm x 11 mm, the pictures are pretty good. 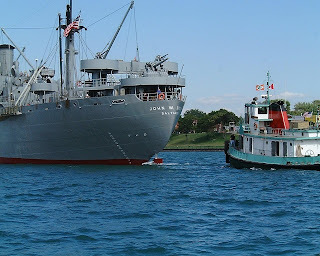 Liberty Ship "John w. Brown"
During the summer of 2003, the Liberty Ship "John W. Brown" came up the Detroit River for a fundraising cruise to help pay for new rivets she badly needed. A dry dock in Toledo, Ohio is still the only dock that makes rivets and could handle a ship her size. 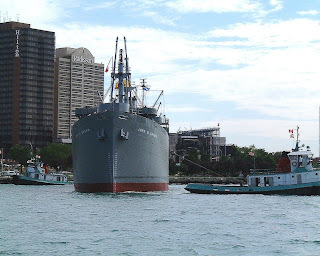 So she sailed up the St. Lawrence Seaway and had over a thousand new rivets installed. To help pay for this, she made a trip up the Detroit River for a one day cruise out into Lake Ste. Claire and return to Windsor, Ontario, Canada. My wife and I purchased tickets and we became part of that historic cruise. It was a beautiful July Saturday with temperatures in the low 80's, mostly sunny with calm waters. As luck would have it, an Air Show was happening at Selfridge ANG Base that same day. 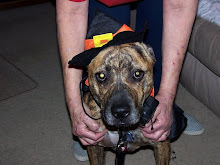 It truly turned out to be one of many high lights of our Golden years of retirement. We had box lunches, below decks in one of the forward cargo holds while listening to music of the era. On deck, a band dressed in uniform played and a group of dancers also in costume danced the Jitterbug and various swing dances. Later an actor who is part of the ships company dressed as General Patton gave Patton's famous speech. Before long, we were under siege by aircraft from the Air Show. Passes were made by a Spitfire, an Avenger, a Swordfish, a B-25 Mitchell Bomber and a Japanese Zero fighter. The guns on deck were maned by members of the Navy Guard which sailed on every Liberty Ship during the War. These guards are also part of the ships company and in uniform. The guns have been rigged to simulate via electric circuitry the flash and noise of the guns, mounted in an open gun tubs protected by thick pads of cork. When we reached the turn around point, a prayer was said and a wreath tossed overboard to honor those lives that were lost during the war from the United States and Canada. When the ship returned to Windsor, visitors were allowed on board the next day, Sunday, before she left to return to her home port in Baltimore, Maryland. 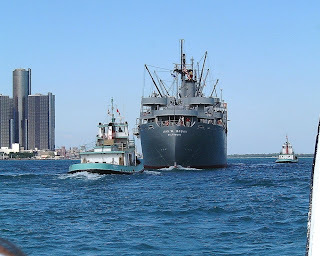 Here are a few pictures of the "John W. Brown" taken by me as she arrived in Detroit on the Friday afternoon before.